Above: That fiery dude is always photobombing people. All right, I think we can stop fluffing PAX and get back to talking about games now. And what's this? My review of God of War III is up at thephoenix.com. I don't know. This game does almost everything right. It's better in some clearly definable ways than its predecessors, and somehow worse in the gestalt. Playing God of War III, I was aware that I was playing a game that had been produced at a high level, but I just didn't care what was happening. There was one sequence in particular that crystallized my tepid reaction to this game. In the Gardens of Olympus, there's a neat puzzle in which you have to look at your surroundings through the jeweled eye of a statue, which will turn a flat image into a usable staircase. As you do this, you need to drag around a big pedestal in order to fill several vessels with water, because they're on pressure plates that will open up parts of the path for you. You also need to use the deceased body of Hera to weigh down the final vessel. This is pretty standard God of War stuff, and it's a fun enough puzzle on its own. It also rewrites all the rules of the game to that point. The garden has walls low enough that Kratos could easily leap over in any other part of the game, but here invisible barriers block his path. (He can't grab onto them, either). Although we've seen him perform astounding feats of strength and agility, including prying open the clenched fingers of a Titan and leaping hundreds of feet in the air with blades akimbo, for some reason he can't carry a 120-pound woman over his shoulder without lurching around like a drunk person. 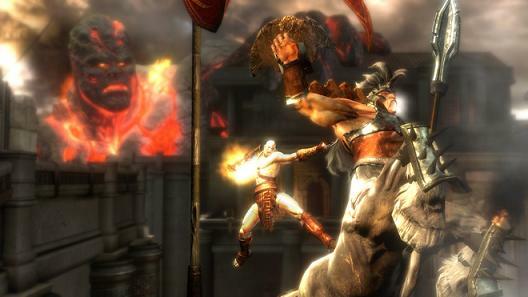 Kratos can't jump while he's carrying Hera, or throw her even a few feet. For the purposes of the puzzle, the game completely handicaps him without any good reason. Beyond that, you can't say the action is bad in any traditional sense. It looks great, plays well, and sticks to the solid fundamentals established by the first couple of games. I felt like they went a little too far over the line with the gore this time around, but that alone isn't the reason I felt so disconnected. We've just played this game before, is all. Time for something else. Interesting comments on the game. I felt the same way about God of War 2. I really enjoyed the first one, and bought the second one the day of the reaease. I never played it past the first couple of levels, though, because it felt like I had played the same thing before, and the sense of wonder that I had with the first game was gone. I think what you are saying about this game sums up my feelings of Mass Effect 2. Yes, it's more refined in just about every conceivable way. And yes, it's devoid of the spirit of the original. It's interesting that Bioware (sorry, I don't play GOW games so I'm not actually going to talk about them at all!) was able to create a blockbuster action adventure (ME2 is NOT an RPG) that has satisfied so many but for me, someone who loved the original, it is just a good game. Nothing more. Sequels have to have the same magic as the original game or else they are worthless. It's got to be hard to make a sequel -- everybody wants it to be different, and everybody wants it to be the same. I think the problem with sequels is expectation. If the original game is not very good then definite improvement is necessary. If the original is great, then for me I want more of the same and I just need it to be incrementally better. But regardless, the original spirit has to be in place. Still thinking about Mass Effect 2, one can look at Jade Empire and see that it is very similar. Both games strip away the RPG elements and give you a very straight forward action oriented experience. It's focused on story, of course, because that's what Bioware does. But there's no real character development, inventory management, or depth of combat. If Jade Empire 2 came out and it was similar, I wouldn't be upset. But if Dragon Age 2 is like that, it would be the last Bioware game I would ever buy. I like shooters and action adventures as much as the next person but I LOVE RPGs. Gary, I cannot, respectfully, disagree with you more. I've heard from many corners that Mass Effect 2 is not an RPG. It is the essence of what an RPG was always meant to be: a Role Playing Game. Players shape a role for themselves, act it out, and live in the results. Inventories, classes, leveling, experience points - those are all mechanical trappings that video game RPGs have focused upon because they lacked the technology to replicate the most important experience of the tabletop RPGs that video games sought to emulate - storytelling. Whether it was limitations of text-based characters, or limitations in graphics even when voice acting became practical, video games have focused on the aspect of the RPG which they were able to handle - complex mechanics - at the cost of focusing on story. Mass Effect 2 is the beginning of the genre becoming what it was always meant to be, and I feel that complaints about ME2 not being an RPG are the result of gamers feeling the coming change. JRPGs will always be about mechanics because they play like comic books - but Western RPGs have been leaning in the direction Mass Effect 2 has headed for a long time. Most of the elements gamers feel are "missing" from ME2 can be found in other games which are decidedly not RPGs - namely progression and experience. Therefore, doesn't that disqualify progression and experience as the qualities that define an RPG? Shouldn't we rather look to define a genre by what ought to be unique to it? In this case, interactive storytelling with high potentiality for multiple results based on user choices? Massive concurment regarding my only real frustration with GOW's gameplay - the inability to break combos to dodge. Really, just Kratos's sluggishness in general. I manage to find a rhythm with God of War, and it's a savage one, but it requires a lot more planning ahead that it could, and as a result feels pretty slow. I also noticed that the game feels more casual-friendly than its predecessors. It holds my hand a ton, particularly during puzzles. Between the on-screen prompts and the way the camera laboriously zooms across the room to show me the solution to a given problem, sometimes it feels like it's playing itself for me. I've been coming back to Bayonetta to try to finally beat it, and I'm struck by how much more imaginative and fluid that game is, in terms of both the combat and the level design. The opening of GOWIII was so incredibly well-done, I only wish that the rest of the game (that I've seen so far) was that brashly creative. But I dig it all the same. Dennis, you may or may not be right. We need Desslock to somehow weigh in on this. But regardless, my particular issue is this: The original ME was highly replayable. Part of that was story, which was much less focused on characters than ME2. With ME2 the story is character-centric, and by that I mean there are many stories, two for each character, as well as an overall story. The original game was much more focused on Shepard and the threat facing humanity whereas this time around it all seems much more laid back even though it's all about a suicide mission. so I guess my point is: I like the micromanagement and my problem with ME2 is not with how streamlined it is but that Bioware chose to reinvent the game mid-series. My issue was with the idea that we're going to define an RPG in part as "a game with micromanagement," such that Mass Effect 2 is somehow disqualified and downgraded to "action adventure game." I would consider micromanagement a feature of RPGs, but not necessarily a defining one. If you want to boil it down to personal tastes, that's a different conversation altogether. Mass Effect 2 had superior characters, but the story left me wanting. It didn't turn out to be much of a suicide mission, and the revelation about the nature of the Collectors felt silly. The rest of the "story" was character development, like you said, which isn't the same thing as "plot." ME1 never had a learning curve for me. The optimal party/weapon/power combination elucidated themselves too easily for my tastes, actually. I don't mind inventory systems if they're relevant. Once I had Spectre gear and found the right combinations of mods I didn’t need an inventory system in ME1. The universal armor and weapon upgrades in ME2 give me the same result with less hassle. Fallout 3's inventory system, by comparison, was relevant due to the repair mechanic and the fun of using different weapons and armor. It's not that I don't like micromanaging, it just has to have a purpose for me. I have my problems with Mass Effect 2, lest I sound like a fanboy. It was too short. The side content wasn't substantive. All the DLC feels like something that should have been included in the retail release. I hope that Bioware quits screwing around mechanics and devotes their time to crafting story AND characters that are worthy of the saga...and a 70-hour playtime, minimum. Regardless of the definition of RPG and whether a particular individual thinks ME2, Borderlands or Final Fantasy XIII is one, I felt that ME2's particular combination of class and skills produced a very generic experience. It did not feel weighty to me, and so my decisions and actions, regardless of class, skills, or party composition, had a sameness to it that made me sure that a replay was out of the question. Yes, I could be renegade this time and paragon the next, but when the battles all jumble together and the party members are interchangeable, it doesn't really matter. I want the class and party to matter. I want the experience to feel more cohesive and to have weight and significance. I felt like the first ME had that, DAO has that, and Fallout 3, although it really has no party structure (companions are interesting but useless there), has it. I just feel like it's a shame that Bioware chose to call ME2 a sequel and yet they stripped away the spirit of the series. Why not call it a spin-off, target it at a different audience, and then give us a real sequel? I think the spirit of Mass Effect 1 was the universe the story took place in and the characters that populated it, not the game mechanics. I can find those mechanics elsewhere, hence they are not unique to Mass Effect, hence, I wouldn't call them as aspect of "spirit." ME2 was a sequel in every way that matters to me. Bioware claims to have made their changes based on audience feedback, so ostensibly they delivered the experience that the majority of Mass Effect fans wanted. Mass Effect 1 only warranted a replay for me based on wanting to see the consequences of different decisions, and earning Achievements, and Mass Effect 2 is no different. They're both 3rd person shooters in terms of combat. Mass Effect 1 just didn't seem to feel that way to some players, I guess, because it still had vestigial trappings of traditional RPGs. IMHO, Mass Effect 2 was the purer vision of what Mass Effect 1 actually wanted to be...so I find no lack of continuity between the two games. Dennis, more power to you bro. Glad you find the silver lining. Me, I'm disappointed. Dennis, I couldn't disagree more with you (equally respectfully). Players shaping a role for themselves and acting out is the definition of tabletop RPGs. Yes, we may argue that video game RPGs couldn't offer the collaborative storytelling experience, and thus had to settle on the mechanics of leveling and battle systems instead. However, I would regard this as the development of a new (sub-)genre, instead of an estranged cousin that keeps envying its tabletop brethren. That they still share the same name does harm in that it creates confusion, but the term RPG still denotes very different things re:tabletop games and video games. Why would video games have to do exactly what tabletop RPGs do? I can have meaningful role-playing, character interaction, and a truly interactive plot by playing a tabletop RPG, but it's counter-productive to bury ourselves around a table loaded with dice, rulebooks and counters. Deep, complex simulational systems are easy to do on a computer, and bothersome on table; engaging, spontaneous storytelling and role-playing is easy to do sitting around a table, but very difficult on a computer. Western RPGs, in my opinion, have not been leaning towards heavy storytelling, quite the contrary, they were mostly about putting you alone in a universe where you can do as you please, explore the world and find out things about it. Why else would we have drowned in oversimplistic proto-plots of the "wizard has stolen the amulet and the kingdom is in peril; go in his dungeon and claim it back!" variety in the 1980s, and even the 1990s? This lineage is still evident in games like the Elder Scrolls, where one can forgo the main quest, and even in most MMORPGs (though The Old Republic claims to change that). BioWare is keen on advancing storytelling, and don't get me wrong, I love what they do (usually). But storytelling is not tied to video game RPGs as much as leveling systems - the player having minute control over the strategic development of his character throughout the gameplay experience, usually by amassing resources such as experience points, where planning out said development occupies a significant part of the gameplay experience and is the major contributing factor in determining the player's chances of success and failure. I believe that is one (tentative, open to criticism, and prone to revisions) definition of the video game RPG genre that is based on what is unique to it. The one you offered, "interactive storytelling with high potentiality for multiple results based on user choices", reminds me more of adventure games (graphical or text-based adventure games, not action-adventures). Hey there, I was just reading your post about Clash of the Titans. Your opinions are very well dictated, I totally agree with your experiences on the previous God of War games. I'm a new blogger who has just recently started a new blog at "zgamewrapup.blogspot.com" and it would be great if you could add me as an affiliate or follower. If not, it's totally cool, and I would love to just hear any tips or advice you have for new bloggers out there.